Leverage the global appeal and customer engagement ability of Facebook to get more traffic and conversion rates for your business. Facebook is evolving rapidly in this network connected world and is influencing not just our social lives but also the business fortunes of various companies around the world. It is acting as a formidable business tool by providing a common platform for the buyers as well as several business entities around the world. Moreover, with a customer base of more than a billion, Facebook marketing seems to be the most viable choice for online business promotion. But, if you are a novice player, you need to master all these tips for making a significant impact among your targeted customers. Effective company- customer relationship is the foremost priority for bringing your business entity close to your targeted customers. You need to understand the mindset, surfing behavior, choices and preferences of your site visitors for building an instant connection with them. Once, you are well aware about the likes or dislikes of your customers, you can present your brand, its products and ideology in the best possible way for making a strong impact on your conversion rates and product sales. However, if you are not capable to do the same, there are various social media marketing services like Velocity that have a skilled workforce, required resources and experience that can help you in building a powerful online brand identity. 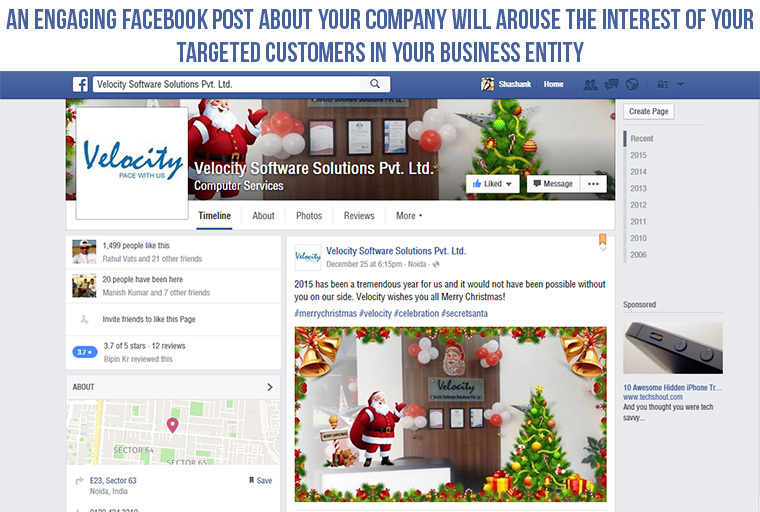 An engaging Facebook post about your company will arouse the interest of your targeted customers in your business entity. Images and pictures tend to play a significant role in the minds of your customers for changing your business fortunes as they affect the human pyschology for a greater amount of time than simple plain texts. Always use a high quality and visually appealing image of your product, company events and other services that can say a “thousand words” about the nature and services of your business entity. Enticing images add value and weightage to your content for driving more number of customers towards your business entity. Try to grab more social media followers and loyalists for your business by running various contests and campaigns from time to time on the Facebook Fan page of your site. These encouraging contests and campaigns can grab more number of customers for your business and is one of the most effective customer acquisition technique. Moreover, with the help of these contests, you can promote your products and services in the most amazing manner. “Humour is the most effective communication tool that can grab the instant attention of your targeted customers” and try to include the same in your Facebook posts. You can make use of memes, captions, comments and other such written content for directing the required number of traffic on your site. Keep a healthy blend of humour, information and images for sharing the popular word about your business entity and its available products. People will love to read and engage with a social media post that is either informative, providing solution to some of the common day- to- day problems, related to the interest of your targeted customers or other such purposes. If your customers can connect with your social media content, you will be able to promote your business entity in the most aggressive way for achieving the unprecedented lead among your business rivals. It is the need of the hour to capitalize these social media marketing tips for making a strong online brand identity and impact among your customers. If you want to make the most in this particular segment, you need to check out the next installment of this article- Facebook Marketing- An innovative way to promote your business globally (Part 2).